Here’s my pile of holey leggings, can you tell I’ve got girls? I don’t mind when they ( the leggings not the girls) are old and have had loads of wear but one pair are new. I was just going to patch the new pair (owned by my ” must wear leggings every day” girl) and put the older pair in my rag bag. Any thing they have grown out of or not longer want/ need/ like I pass on. 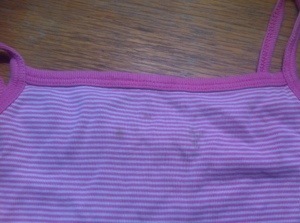 Unless it has stains or is too old and raggedy then it either goes in my rag bag or on the compost. The initial plan with the rag bag was, rag rug making or stuffing. The stuffing idea didn’t work it was too lumpy. Anyway I digress. So I went to the rag bag to find some suitable stretchy material for patching. It is really important to patch something stretchy like leggings with a stretchy fabric. Even better if it has the same amount if stretch as the item to be patched. New wine in old wine skins and all that. I came back with an old pair of leggings and made the mistake of involving little miss. She wanted me to patch the old pair with fabric from the newer pair. Arrgghhhhh. New plan, patch both pairs with some other fabric, don’t let her know what I am doing till the job is done. 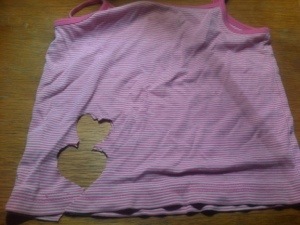 Voila, one vest with a stain at the top from the rag bag. And two more pairs of leggings to patch, how did that happen? Icut free hand hearts out if the vest fabric. Next I sewed them to the leggings with blanket stitch. Any stretchy stitch would do, this is necessary so that when the fabric stretches the stitches don’t pop and break. If you have a go try not to stretch the fabric as you are sewing or the patch won’t lie flat. Ta dah one four pairs of patched leggings ready for my girls when they wake up in the morning. 1. Find some suitable stretchy material for patching. I like to chose a contrasting colour/ pattern to make a feature of the patch. It is really important to patch something stretchy like leggings with a stretchy fabric. Even better if it has the same amount if stretch as the item to be patched. New wine in old wine skins and all that. To test hold both pieces of fabric in your hand and gently tug them, you will soon feel wether they have the same amount of stretch or not. 2. Cut out your patches. pin to the fabric, making sure it is flat and the fabric is not stretched at all or the shape will be distorted. It helps to do this on a flat surface. Cut the fabric round the paper template. You can pin the patch onto the leggings, make sure the pins just go through the layer to be patched. I always start my hand sewing by anchoring the thread in the fabric*. I sewed my patches to the leggings with blanket stitch. Any stretchy stitch would do, this is necessary so that when the fabric stretches the stitches don’t pop and break. Try not to stretch the fabric as you are sewing or the patch won’t lie flat. 4. Sit back and enjoy your handy work. * I sew two stitches on top of each other but don’t draw the second loop through. I then pass the needle through the loop creating an anchor. Sometimes I do a second loop and knit for extra security. I finish my sewing in this way. The tread is secured without fiddly knots which can pull holes on the fabric. If you would like any more details of a any of these processes with some piccys and diagrams. I would be happy to oblige, just leave a comment. 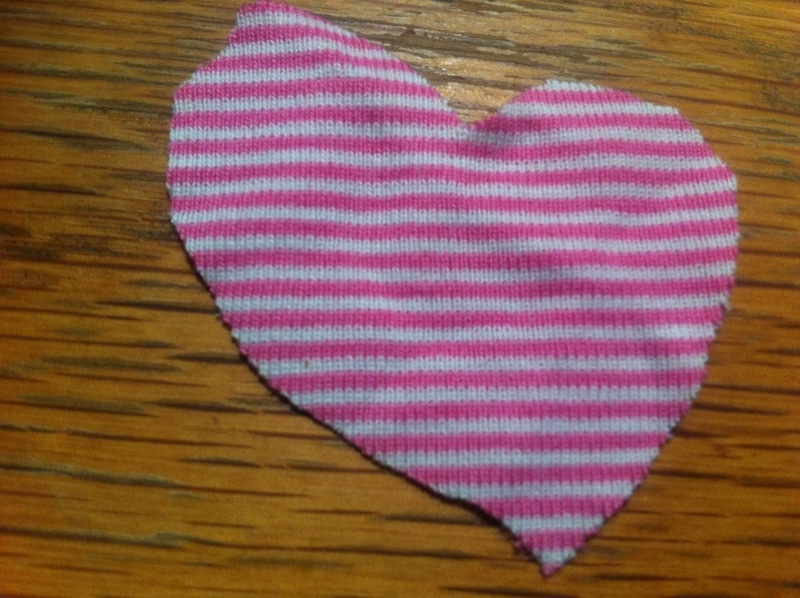 This entry was posted in hand sewing, sewing and tagged frugal, mend, Sewing. Bookmark the permalink. 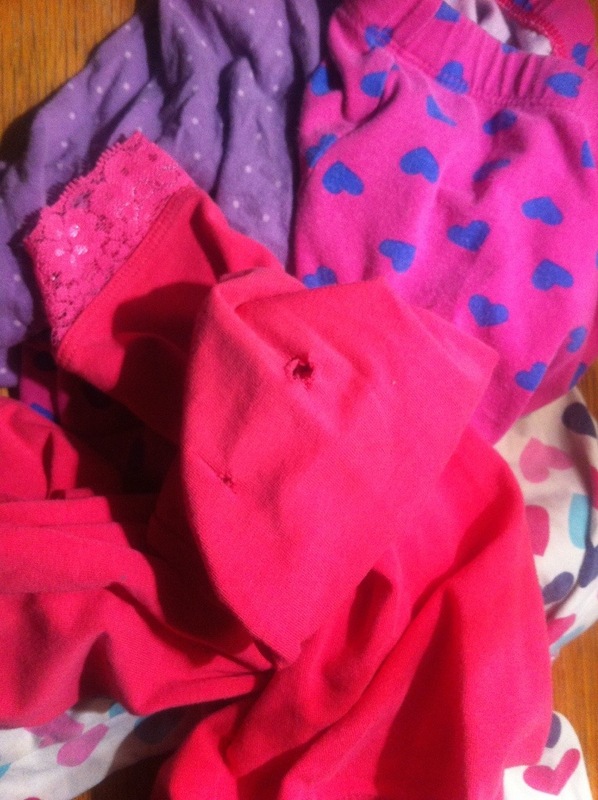 Those pink ones look exactly like the worn once Jumping Beans leggings I have to patch–usually that brand is better quality! Just checked the label, they were George at Asda ones. However the other knee is going now, so the quality does tell in the end. Could you please add step by step photos with sewing instructions on how to sew the patches onto the leggings. I’ll get on it and let you know when it done.